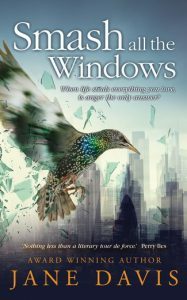 In the UK, Jane Davis’ self-published novel Smash All the Windows has won the inaugural Selfies Award for a self-published work of fiction. Smash All the Windows explores the emotional lives of the families of victims in the wake of a disaster. It is Davis’ eighth novel. The judging panel was ‘impressed not only with the quality of Davis’ writing, but also with her committed publishing and marketing of the novel’, according to BookBrunch, which administers the award. Jane Steen was awarded a runner-up certificate for her novel Lady Helena Investigates. Winners were chosen from an all-women shortlist of eight. Davis wins £1500 (A$2685), a ‘bespoke book cover design’ by designer Aimee Coveney and a book publicity campaign worth £1000 (A$1790). Davis was presented with the award at the 2019 London Book Fair. In its inaugural year, the award is for adult fiction only, but will expand to include other categories in the future. Entry is restricted to UK-based authors. For more information, visit the Selfies website.